In 1994, the Corral Creek-Blackwell Complex scorched 140,100 acres of the Payette National Forest, leaving blackened conifers and meadows of ash in its wake. Fires are not new to Idaho. In 1910, the largest fire in U.S. history dubbed “The Big Burn” slashed over 3 million acres of northern Idaho, Washington and Montana. It destroyed many towns and killed at least 87 men, mostly inexperienced fire fighters of the time. In the U.S. Forest Service’s (USFS) infancy there were few trained in the art of combating wildfire, and most thought fire was something that could easily be controlled by man. In the summer of 1910, early snowmelt, summer drought, and an abundance of dry lightning storms ignited dozens of fires that soon grew into several massive blazes. Every able man was required to stay and defend the towns; women and children were ushered into fleeing trains. The few brave USFS rangers risked their lives to defend the forests and civilizations, many incurring serious wounds. One such man was Ed Pulaski who lost his vision and suffered serious burns successfully holding 28 men inside a mineshaft as the fire raged outside*. The blaze, although tragic, proved beneficial for the USFS, demonstrating the worth of the rangers trained in wildfire suppression. For decades the USFS succeeded in putting out the vast majority of every fire on Federal land before they grew out of control. Smokey Bear taught the nation that wildfires were dangerous and unnatural events that could be controlled and avoided. Yet in the 1970s, biologists began to preach of the good tidings of fire, of their essential role in the ecosystems of western forests. Gradually, the USFS began to withdraw certain efforts to fight fire in the natural world, trying to reintroduce the natural process. Unfortunately, seven decades of fire suppression left a bounty of excess fuel on the landscape ready to ignite. Such a superfluous amount of fuel may be the culprit of the infamous Yellowstone fires in 1988 and perhaps the Corral-Blackwell fire of 1994. No doubt, wildfires are an essential natural process. Yet years of fire suppression, and the anthropogenic influence on climate change has increased the severity of frequency of large fires in the U.S. up to ten fold since 1970. Further, fires are moving up in elevation to ecosystems likely not adapted to the disturbance. One century after “The Big Burn” and 21 years since the Blackwell Fire, Matt and I entered the Payatte National Forest to survey the impacts on the vegetation of the high granite peaks. In five days, we summited 5 peaks, travelling an average of ten miles each day, mostly off trail through a hazardous maze of downed trees and blackened boulders. Our first and largest day was South Loon Mountain, the highest in the range and a brutal 16 mile round trip from the Duck Lake Trail head. Two miles into the journey, the trail ends, giving way to a forest of fallen black logs crisscrossing the terrain like a giant game of Pick-Up-Sticks. We navigated the fallen forest, only to reach steep rock, which we scrambled up. On top, to our delight we found that the very summit of the peak did not burn: an island of refuge among a sea of wreckage. 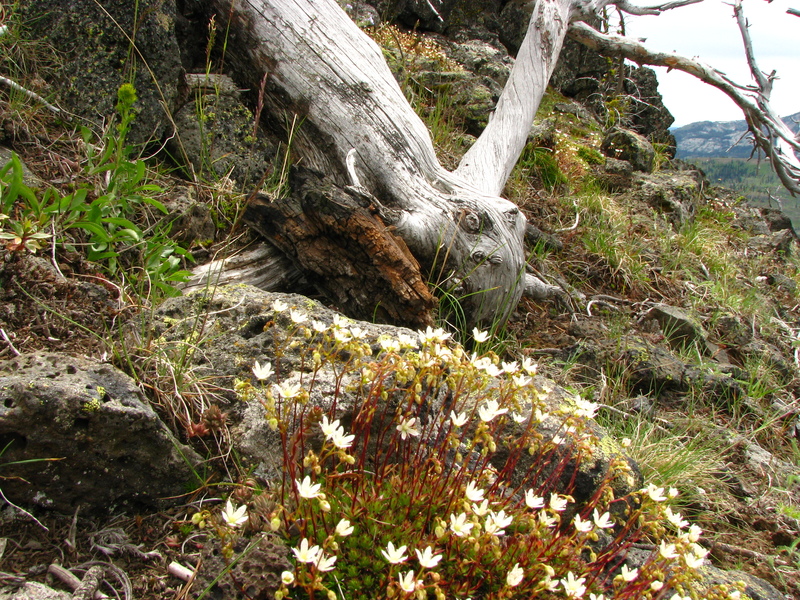 There, at the summit stone, Saxifraga austromontana flowered in full force. Clinging to the cracks in the stone, the low lying plant with sharp toothed leaves gave forth to dozens of beautiful cream colored flowers, each petal dotted with yellow, orange and red. Not all peaks survived the flames. 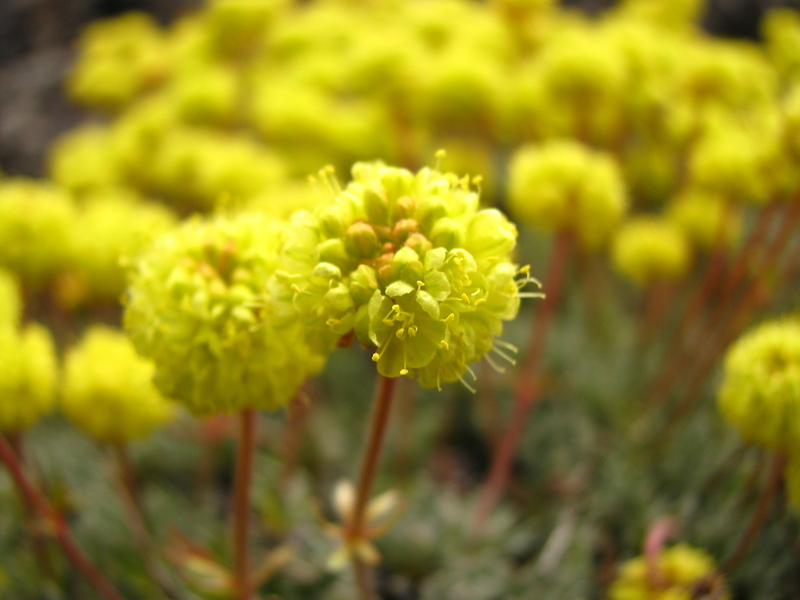 The Idaho Department of Fish and Game noted that the Tobias’ Saxifrage (Saxifraga Bryophora var. 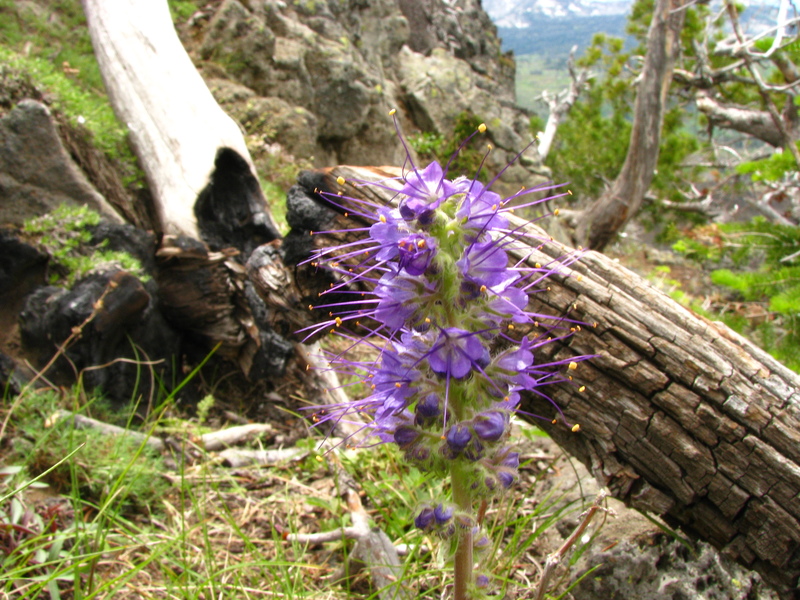 Tobias), one of the rarest plants species in Idaho was extirpated (locally extinguished) from 3 subpopulation locations, and attributed the loss to the 1994 Blackwell Fire. On our final day Matt and I scurried up the granite face of unnamed peak 8610. The entire flank of the mountain, up to the very apex showed evidence of fire. The blacked skeletons of Whitebark Pine lingered on the precipitous slopes. On top, we indeed found S. austromontana, yet the population was not robust. Likely, several plants were spared from the burn high in cracks on the steep granite cliffs of the north face, able to slowly repopulate the mountain after nearly 2 decades. 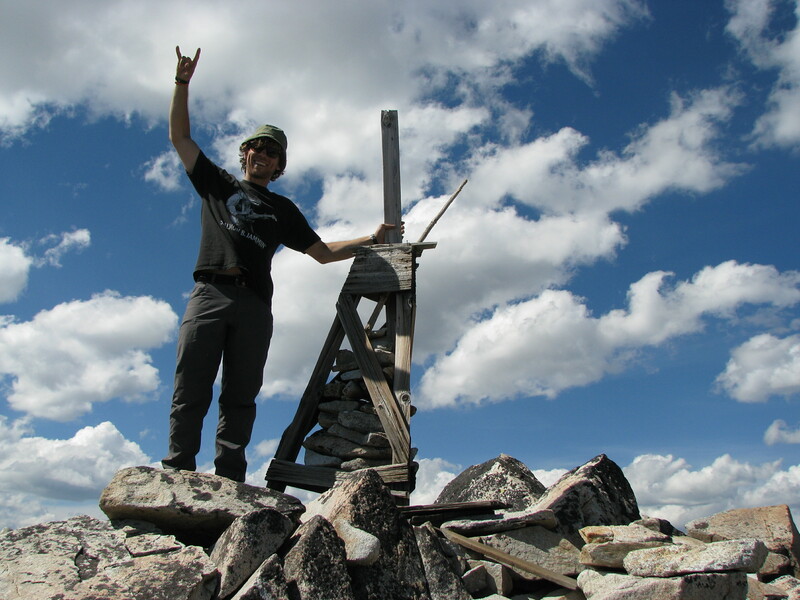 Atop, Matt dubs the unnamed peak Mt. Shelbert, after his recently passed canine companion. On our decent, we run into a large maternal heard of elk. A single calf, separated from the group squeaks like a blue-jay calling to its mother. We reflect on the wonder of our expedition, the freedom of exploring new terrain, and the ambition to raise awareness about the conservation of the alpine. Despite fatigue, we are totally stoked! 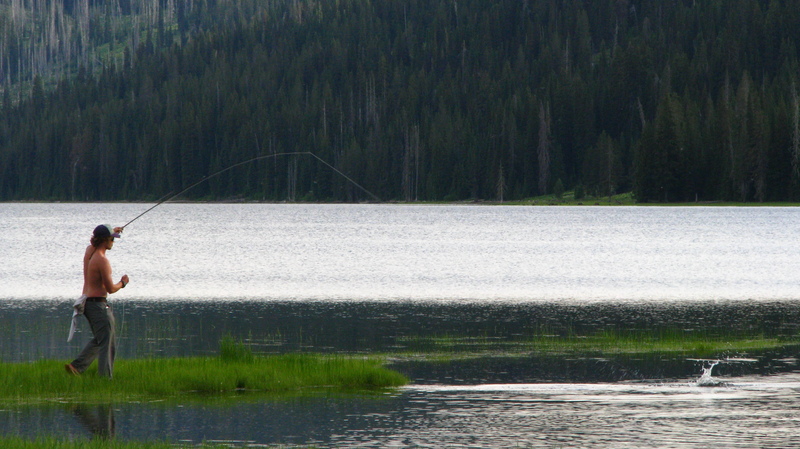 …The Journey continues as we head to the high Uintas in Utah, then down to Colorado. *For more detail on the 1910 fire, I highly recommend the book The Big Burn: Teddy Roosevelt and the Fire that Saved America by Timothy Egan. Saxifraga austromontana near the skeleton of a burned whitebark pine. 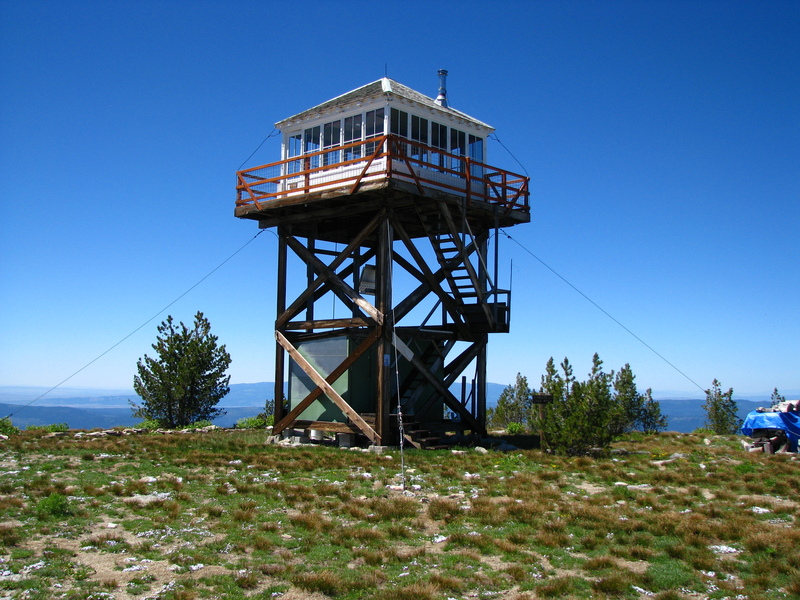 The fire tower on the summit of Granite Mountain. 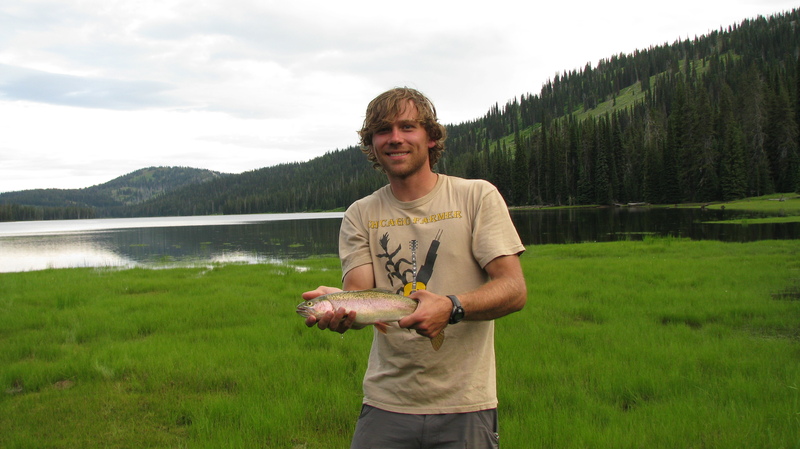 Matt caught the biggest fish of the week! One of my favorite past times.